Some companies use accelerated depreciation methods to defer taxes into future years, such as double declining balance depreciation. The double declining balance depreciation method seeks to take most of the depreciation charges upfront, in the early years, lowering profits on the income statement sooner rather than later under the theory that certain assets experience most of their usage, and lose most of their value, shortly after being acquired rather than evenly over a longer period of time. The lowered profits also result in lower income taxes paid for those earlier years. 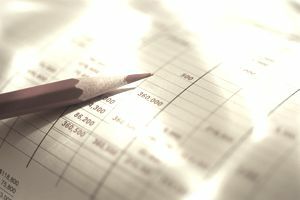 The double declining balance depreciation method shifts a company's tax liability to later years when the bulk of the depreciation has been written off. The company will have less depreciation expense, resulting in a higher net income, and higher taxes paid. Due to the accelerated depreciation expense, a company's profits don't represent the actual results because the depreciation has lowered the net income. This can make profits seem abnormally low. However, as the business continues to buy and depreciate new assets on a continual basis over the long term, this ceases to be an issue. Get your calculator ready or your spreadsheets at hand because calculating the double declining balance depreciation method takes a bit of work. Companies may use either of two versions of the double declining balance method, the 150-percent version, or the 200-percent version. For illustration, the following walks through a hypothetical example using the 200-percent version. Assume that you had a $100,000 asset that will be worth $10,000 at the end of its useful life, giving you a balance subject to a depreciation of $90,000. Furthermore, assume that the useful life of the asset is ten years. Taking the $100,000 asset acquisition value and subtracting the $10,000 estimated salvage value, you now have $90,000 subject to depreciation. Under the straight-line method, you would take $90,000 and divide it by the number of years the asset is expected to remain in service, in this case, 10 years. Depreciation expense would have been $9,000 each year. In this case, take the $9,000 would-be depreciation expense and figure out what it is as a percentage of the total amount subject to depreciation, which is $90,000 in this illustration. By taking $9,000 and dividing it into $90,000, you'll arrive at 0.10, or 10.00 percent. Now, for the 200 percent method, multiply (2 x 10.00 percent) to get to 20.00 percent. If you had been using the 150 percent double declining depreciation method, you would have taken (1.5 x 10.00 percent). Next, apply a 20 percent depreciation rate to the carrying value of the asset at the beginning of each year. Pay attention to that as it can be a common mistake to apply it to the original amount subject to depreciation, which is incorrect. This continues until the final year, in which a special adjustment needs to be made to complete the depreciation and bring the asset to salvage value. The final year adjustment was calculated because the carrying value at the end of the ten-year period would have been $10,737.42 but you know that the salvage value was $10,000.00 and should be the correct ending number.